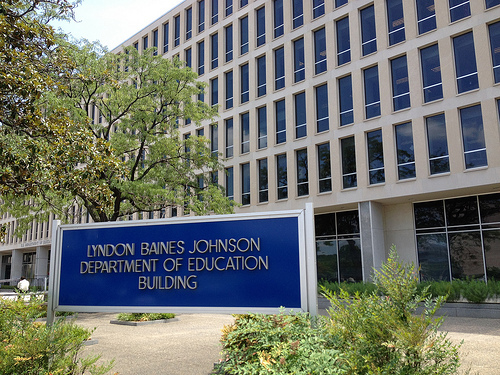 The Department of Education wants more power over colleges. If the above list isn’t self-evident proof that the federal government is incapable of good education policy, consider the implications of the president’s proposal. Under Obama’s plan, the Department of Education would be able to arbitrarily assign scores to universities based on whatever criteria they want, then deny funding based on these scores. This would allow near complete discretion on the part of federal regulators, and would would essentially allow the Department of Education to make unilateral demands that educational institutions do whatever they want, using the threat of withholding funding as leverage. The use of federal funding as a bullying tactic for state and local government is the same loophole the feds used to get around the constitutional fact that education is a state and local issue, not a federal one. The purse strings, which are supposed to be controlled by Congress, not the president, are a powerful motivator. Whereas Common Core focuses on academic standards and performance, the proposed rating plan stresses access and affordability. Among the criteria advanced are graduation rates, retention rates, and the rates of accepting disadvantaged students, but overall the proposal is very short on specifics. Offering money as a condition for certain outcome is a sure way to see more of that outcome, at least on paper. What this means in practice is that whatever the specific criterion for funding is gets precedence over anything actually meaningful. People respond to incentives, often by trying to game the system. In his excellent book Who’s Afraid of the Big Bad Dragon?, author and education expert Yong Zhao shows how this kind of system has backfired in China, a model that too many American politicians unfortunately want to emulate. China boasts the most patents of any country, and the most scholarly articles published, largely because the government demands performance in these areas. Far from being a success, however, the incentives put in place by a demanding and oppressive government mean that , while millions of patents are filed, few are of any actual value. While thousands of academic papers are written and published, most or bought or plagiarized. The obsession with meeting quotas supersedes any genuine attempt at innovation. The federal government can demand a certain graduation rate of colleges, and they can probably get it, but it will be achieved by lowering the standards for graduation, passing otherwise unqualified students in order to keep the numbers up. On the other hand, the market is a far better determiner of student outcomes, because parents and students decide which institutions to patronize based on a wide variety of desirable criteria, not blind obedience to selected statistics. The federal takeover of education will crush any individuality in higher education, and impose the kind of soulless conformity we see in totalitarian states like that of China. The only way to achieve better educational outcomes that actually matter is with greater student choice, and more localization of control. Obama’s plan would do the exact opposite, applying the same misguided premise of Common Core to higher education as well. What type of bovine feces are you attempting to spread here? " ...the Department of Education would be able to arbitrarily assign scores to universities ..." What part of the difference between a community college (a.k.a., Ma and Pa Kettles country school) and Cal Tech do you not comprehend? I've taught at University for many years and I also taught at community college once. There is NO similarity. A community college is primarily a two year program of remedial reading and math while University (or college) level courses actually break new ground. Universities and colleges have applied for (and received) government research grants since before WWII. I've written many proposals myself and received several grants. Getting government research money is nice, but the government has never had any controi over curriculum, just over areas to be researched and studied. Once again I see a non-issue being created for purely propaganda purposes by the believers in Ayn Rand.